Order now through Chelsea Green Publishing or Amazon! 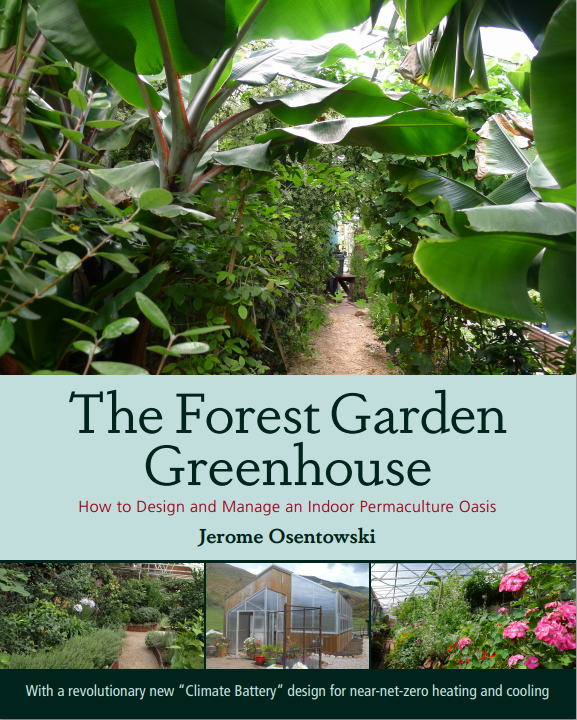 For the last ten years, and with the help of each intern and volunteer to come through CRMPI during that time, Jerome has slowly crafted and compiled information for his first book on indoor forest gardening. Osentowski, director and founder of Central Rocky Mountain Permaculture Institute (CRMPI), farms at 7,200 feet on a steep, rocky hillside in Colorado, incorporating deep, holistic permaculture design with practical common sense. It is at this site, high on a mountaintop, where Osentowski (along with architect and design partner Michael Thompson) has been designing and building revolutionary greenhouses that utilize passive and active solar technology via what they call the “climate battery”—a subterranean air-circulation system that takes the hot, moist, ambient air from the greenhouse during the day, stores it in the soil, and discharges it at night—that can offer tropical and Mediterranean climates at similarly high altitudes and in cold climates (and everywhere else). Osentowski’s greenhouse designs, which can range from the backyard homesteader to commercial greenhouses, are completely ecological and use a simple design that traps hot and cold air and regulates it for best possible use. The book is part case study of the amazing greenhouses at CRMPI and part how-to primer for anyone interested in a more integrated model for growing food and medicine in a greenhouse. With detailed design drawings, photos, and profiles of successful greenhouse projects on all scales, this inspirational manual will considerably change the conversation about greenhouse design.